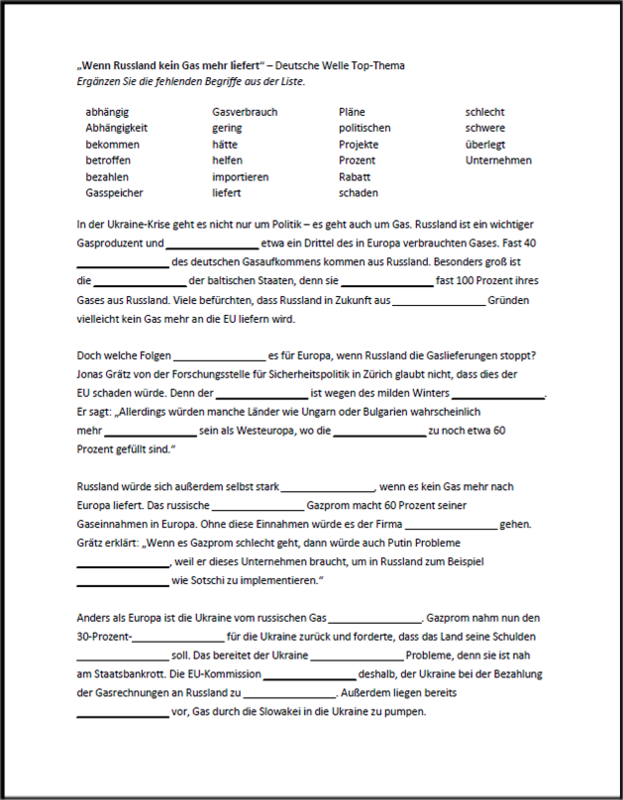 Here are additional materials and activities I have created for teaching Deutsche Welle’s Top-Thema module entitled “Wenn Russland kein Gas mehr liefert“. The original Deutsche Welle materials can be accessed from the theme webpage, or the text and exercises (pdf) and audio (mp3) can be downloaded for offline use. In the post Teaching with Deutsche Welle’s Top-Thema and Video Thema, I outline how I use these Deutsche Welle modules in an intermediate- to advanced-level courses with varied goals. Visit that page to see how my students begin to work with the materials Deutsche Welle provides. Here I am offering and explaining the extension activities that I use after we have exhausted all of the excellent materials Deutsche Welle provides to accompany the text. Downloads of all exercises described below are linked at the bottom of the page. Students work with words from the text using the context of the article itself. But they may not refer to the original article. If students have read closely and repeatedly, the language should be familiar to them. When my students did this activity, the language of the Deutsche Welle text was not as familiar to them as it should have been. This provided an opportunity to talk about homework and study habits. Some students admitted that they read through the text only once or twice at home, mostly silently, and some didn’t even listen to the accompanying audio. * Sigh. * I reminded them how important it is to listen to the audio, note pronunciations they are unfamiliar with, to read multiple times, to read out loud, to read silently, and then to read again, and to read for new understanding each time. This activity has two parts. First students work collaboratively in an attempt to define and explain selected words and phrases from the text. They should be speaking and not just silently writing. They can and should reference the article when needed, because seeing the word in context can help jog the student’s memory, make the concept more concrete in his/her mind, and reinforce correct usage of the words and expressions. Through collaboration, students learn from each other. Further questions for discussion begin with some basic content based on what students read in the Deutsche Welle article. For example: Wie viel Prozent des Gases, das Europa verbraucht, kommt aus Russland? Wer ist vom russischen Gas abhängig? Then they progress toward having students make inferences from the text and express their own ideas and opinions: Was ist Gazprom? Meinen Sie, dass Russland seine Gaslieferungen an die EU bald stoppt? Warum (nicht)? Wie könnte die EU der Ukraine helfen? Soll die EU der Ukraine helfen? Warum (nicht)? The Deutsche Welle articles are an excellent resource for drawing students’ attention to meta-linguistic issues. The length of the articles is manageable and the language contained in them offers many opportunities for having students step back from the content of the text and observe language use in action. With this particular article, I chose to have students examine German sentence structure, and more specifically, the location of the verbs in sentences — because after all, German sentences revolve around the verb positions. I find that students at this level still need to work on their sentence structure skills, especially as their own sentences get longer and more complex. When they analyze German language samples more closely and when their attention is drawn to a certain feature of the language, they become more deeply familiar with real examples of that linguistic feature in action. And it gives them models to follow when they are forming their own sentences. In this activity then, students mark the underlined verbs, identifying each as one of three types: a conjugated verb that agrees with the clause subject (V1), a dependent verb that appears in the same clause as V1 to complete the predicate (V2), or a dependent verb appearing in a clause of its own without a V1 that completes the meaning of another clause (VX). If they mark the verbs correctly, some patterns will emerge. Every clause will have a V1. A V2 will never be conjugated; it will be an infinitive or a past participle. A single clause can have more than one V2 (e.g. Der Brief muss geschrieben werden. ), although it doesn’t happen in this particular article. A V3 will be the infinitive in an infinitive clause. And word order patterns will emerge — independent clauses, dependent clauses, and infinitive clauses all have their own word order rules. How you introduce this activity will depend on the background of your students. I like to give minimal instruction and see what students do with it and address questions as they arise. Direction lines are in English. I teach the concepts in German, but it is useful for my English-speaking students to have the English explanation of verb types in front of them to refer to. For more advanced students, I would leave out the underlining and ask them to find and underline the verbs and then identify them as V1, V2, or VX. This is another sort of activity that draws students’ attention to meta-linguistic issues. Analyzing texts for cohesion helps make students aware of writing techniques that they can apply in their writing — not only in German, but in any language. For this activity, I mark several of the cohesive devices in the article. Adverbs, conjunctions, pronouns, synonyms, repetition of terms, word order, parallel sentences, a logical structure, and more — all of these things work to link phrases, sentences, and paragraphs together into an integrated text. Students explain how each marked cohesive device helps organize and integrate the content of the text. For instance, the repeated appearance of the word Gas, both by itself and in compounds, maintains a focus on the core theme through the whole article. And the parallel phrasing in the first sentence using es geht um and the use of the adverbs nicht nur and auch put Gas on an even level with Politik as source of crisis in the Ukraine. And tying two clauses together with the conjunction denn identifies the information in the second clause as further explanation of the first statment. This activity really requires students to think about the content of the text as they reflect on the way language works to make a coherent whole. For more information about cohesive devices (and many other essential tools for building writing skills) in German, you could look for a copy of Essay-writing in German by Winfried V. Davies. It is unfortunately out of print, but there are a number of used copies still floating around out there. Here are the downloads for “Wenn Russland kein Gas mehr liefert” in a single pdf-file. 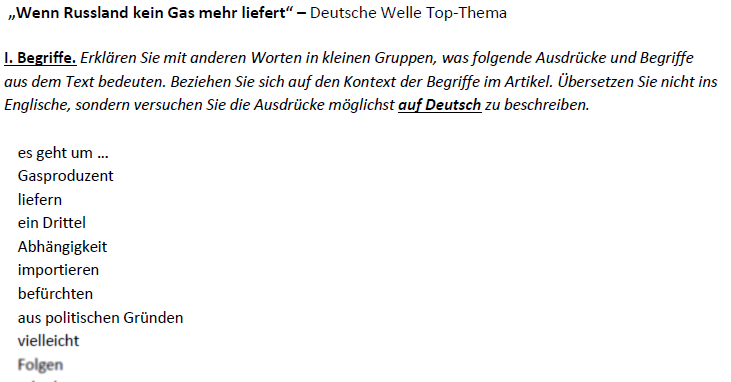 And the original Deutsche Welle Top-Thema page in HTML, with audio and comprehension exercises, is here:”Wenn Russland kein Gas mehr liefert“.